Saturday March 30th 1895 I was busy with my baking and had churning to do. I still found time to write a short letter to Ida Will was lying in the lounge mosty of the forenoon. We went to town after dinner and had hardly time to do our errands when it began raining and we hurried home. It was a rainy evening. I hemmed a new table cloth that I cut this afternoon. Sunday March 31st 1895 I was busy about the work most of the forenoon. It was cloudy and threatening rain and we did not go away from home but put in the time reading and writing. Monday April 1st 1895 I was busy all forenoon with cleaning up the house and doing baking. I went down town with Will in the afternoon but as it looked like rain we did not go over the river. Will was done to Anderson this morning for a plow. When we came home I found Miss Linder the teacher here. I will board her. Tuesday April 2nd 1895. It was pleasnt day. I swept rooms up stairs and cleaned the dining room and all the silver on the side-board. Will helped me wish in the afternoon. I then cleaned the kitchen and began the soap. 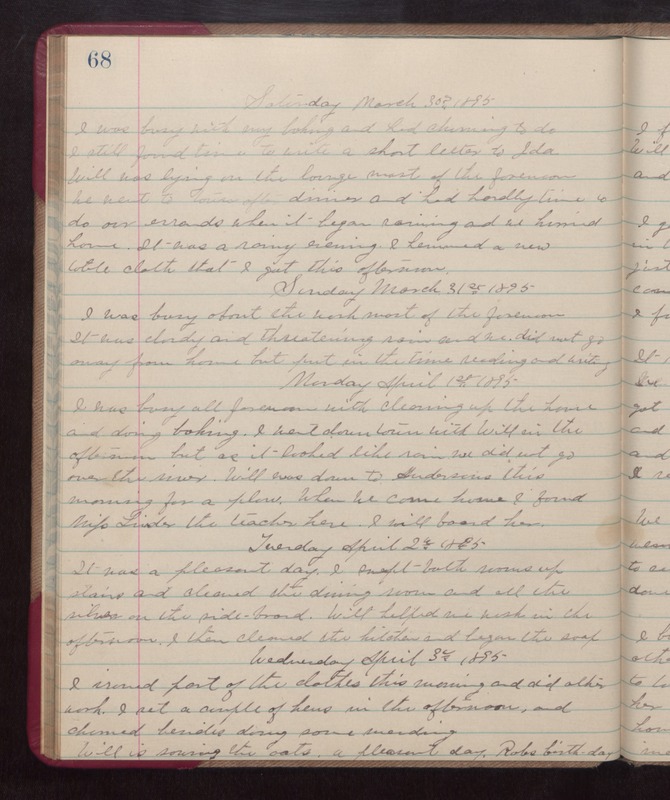 Wednesday April 3rd 1895 I ironed part of the clothes this morning and did other work. I set a couple of hens in the afternoon, and churned besides doing some mending. Will is sewing the oats. a pleasasnt day. Robs birth-day.